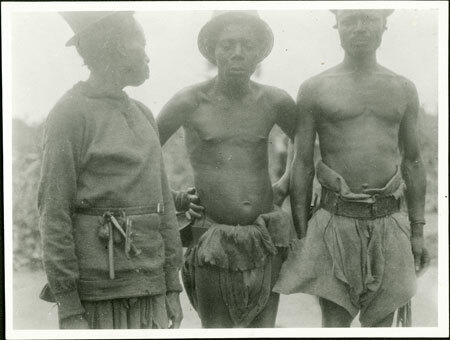 A three-quarter length portrait of a group of three men: from the left they are identified as Bagbe, Buzo and Bawili son of Bagbe). Bagbe is wearing several objects suspended from his belt, possibly a magic whistle or other witchcraft-related items. I have retained the spelling Bagbe as used elsewhere in the handlist. Information with [1998.34.405] indicates that Bawili (Bavili) is a son of Bagbe. Morton, Chris. "Group of Zande men" Southern Sudan Project (in development). 03 Jan. 2006. Pitt Rivers Museum. <http://southernsudan.prm.ox.ac.uk/details/1998.341.497.2/>.